Over the years while writing this blog the responses, for the most part, have dealt with the subject matter of that particular week. Having said that, by far, the number one comment from all readers has been how much they have enjoyed either hearing about the past or remembering the past. * The Moose is loose! * Pick a pair of six packs! * You only go around once in life! * Great taste – Less filing! * From the land of sky blue waters! Obviously, I could go on and I have left out a number of remember-when lines, however, feel free to send the one(s) that you remember. Make sure they are pre-2000 and I will add them to the list during the week. To all, have a great Thanksgiving! We do not remember days, we remember moments! 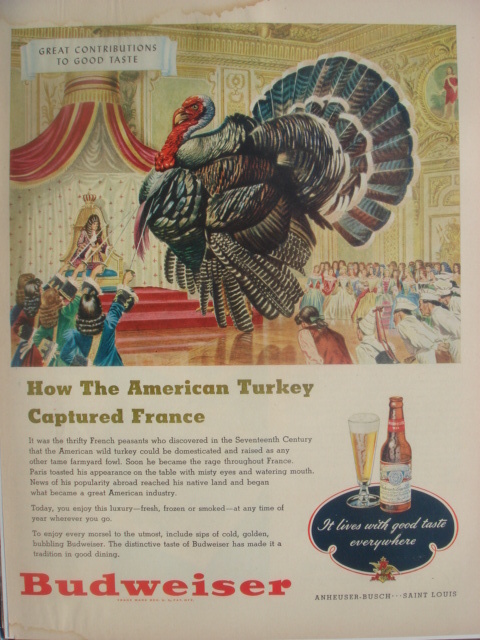 Editors notes; Readers comments – Steel cans, Erlanger, Johnson Jet tap rods, Miller Kings, Miller pony’s, Coors Golden, Champagne of Bottled Beers, America’s Fine Light Beer, and You only go around once in Life! In early 1987, I sold my interest in the Schlitz operation and soon left to work with Coors Brewing Co. in Golden. That year was the 5th anniversary of the Great American Beer Festival. I had intended to go, but instead, Coors sent me on a project during the event. Then in 1992, while in Denver, I once again wanted to attend the GABF, now in its 10th year. Even then, getting tickets was not easy, but it could be done, however, just like in 1987 I was unable to attend the event. Finally I had the opportunity to be present at the GABF some 10 years later while working at Glazer’s. By that time, tickets were extremely difficult to attain. 2016 will be the Oregon Brewer’s Festival’s 29th year, and what once began as a two-day weekend event, is now four days in length. Both the GABF and the Oregon Brewer’s Festival are premier events for the craft industry, attracting hundreds of breweries, beers and thousands of fans. Colorado and Oregon were two states that supported and acted as incubators for crafts in the early years. This early support of the industry has resulted in the two largest craft festivals in the US. No telling how many thousands of consumers were exposed to the wonderful new beers showcased during these events. The craft industry has grown as states have changed their beer laws allowing crafts a chance to reach the market and the consumer. Texas is one such state. With the recent changes in beer laws and restrictions, the craft industry has taken off in Texas. One of the results is the creation of Untapped, Dallas’s version of the GABF and the Oregon Brewers festival. Founded only four short years ago with 50 breweries and 100 beers, Untapped now hosts more than 100 breweries and over 400 beers, 45 of the breweries are from Texas representing 175 beers. Of these 45 Texas breweries, 25 are in the DFW area! Untapped now lasts one week with a number of craft tastings, sampling, and nightly shows across North Texas in many local craft bars. Last Saturday night’s big concert and show drew almost 10,000 craft fans. As in Colorado, Oregon and other states, crafts are having a huge impact on the overall industry in Texas. Even with this great interest in crafts, two reoccurring themes continue. The first has to do with the overall quality of some of the beers and the second is the crafts’ (and importers’) frustrations of trying to get to market or even finding a wholesaler. While there were many high quality beers served and offered at Untapped, there were also some beers whose quality and taste were questioned. One would have to believe that those beers will not be at next year’s show. There is a great frustration with wholesalers among the industry. Several brewers and importers commented that they were told by wholesalers that they were not taking or viewing any new crafts the rest of the year. The success of Untapped, not unlike the success experienced in Oregon and Colorado illustrate that crafts in Texas are becoming a major force in the market. As in the afore mentioned three states, these trends of success will continue across the country. To all craft breweries, importers and wholesalers, opportunity does not knock, it presents itself when you beat down the door! Editors note; Untapped is a music event held one night. The week of beer is known as NTX Beer Week. Over the years, much has been written about InBev’s 2008 takeover of AB and the ensuing acquisitions ABI has made since this time, including their current target, SABMiller. One wonders just how this came about. Was it just something InBev had targeted or perhaps they were aiming at these particular companies as the fulfillment of a plan created years ago? Simply put, we are here today, and let’s agree to go there tomorrow. Outside the annual planning process and cycle, just how many beer companies actually look down the road and attempt to picture what they should or could look like in ten-plus years? If they did, would they even look anything like they are today? Rebuffed by the beer industry throughout the 90s, Glazer’s had tried on a number of occasions to break into the beer side by buying a distributorship. Finally, after agreeing to hire a team of experienced beer managers, Glazer made their way into the beer side. My focus at Glazer’s was to build and expand their beer portfolio, but I never saw or even heard, that a long term plan existed, just that the company wanted to expand. Glazer’s had great success in getting into beer, not only by buying beer distributorships, but also by getting statewide and major market key brands including New Belgium, Sierra Nevada and Boston, and other crafts. Glazer’s even dipped into some imports including Asahi, Paulaner, Warsteiner and Crystal. The list goes on. By the mid-2000s, sales from beer were hundreds of thousands of dollars across all Glazer’s s 12 states, which then included some MC distributorships. In early 2006, I left Glazer’s to head up Warsteiner. Glazer’s was Warsteiner’s largest distributor in the US, distributing the brand in a number of states including Illinois and Texas. In 2007, Glazer’s let me know of their intent to sell Warsteiner to Ben E. Keith and Silver Eagle, along with all their other beer brands. This process was accomplished in all their markets except where their operations were anchored by a MC house. Glazer’s was getting out of the craft/import business in their wine and spirit houses. Congruent to this time, word was out about a pending merger between Glazer’s and Southern Wine. The merger did not take place, however, over the next seven or so years, Glazer’s continued to acquire MC operations while selling off brands they distributed outside their MC markets. This has been done in all their states, except Arkansas. Not long ago, Glazer’s JV, along with Charmer-Sunbelt in Arizona, sold off their beer portfolio to various beer wholesalers. What was baffling was just why would a company such as Glazer’s, who had made a significant financial commitment to build a beer empire, sell off all these crafts and imports just as this segment exploded in growth, revenue and profit? Last month’s announcement of the renewed merger between Glazer’s and Southern Wine, along with Charmer’s and Writz announcement of the same, might shed light on Glazer’s actions. Franchise contracts could be the culprit. Consider that had the proposed merger taken place in 2008, the beer vendors would have been free to move their brands to other wholesalers of their choosing. Glazers knew this, and systematically went about selling off all these great brands, state by state, while both Southern and Glazer’s waited until the action was completed. Glazer’s got a great multiple for these brands, the acquiring wholesalers not only got brands they never thought they could acquire, they will have them quickly paid off with the rapid expansion of the craft segment and, finally, the vendors get into beer houses which will grow their volume. The merger now takes place. From the outside it appears Glazer’s has known for years what it wanted to look like and worked to achieve that goal. Management is all about managing in the short term, while developing plans for the long term. The status quo is simply unacceptable. In a past post I referred to a time some decades ago, when my aunt lived in Chicago and worked at Sears. She stopped by the local tavern on her way home to buy a bucket, the fore runner of today’s growlers, of Pabst Blue Ribbon to take home. It’s a safe bet that the tavern only served Pabst on tap. In fact, in the years I visited her, I never saw her drink any other beer than Pabst, ever! Consider the way my aunt bought beer. Her choice is the personification of a time in the beer industry which will never return. In a day and age when shopping is done on line and malls are dying, these changes are also bleeding into the beer industry. Technology is now tapping into beer, literally. A number of bars have installed self-serving pouring systems. This eliminates the need for bartenders. The customer is provided a wireless bracelet or card that enables them to operate the tap. Providers have systems for table, wall-mounted and mobile units for events. The customer is charged by the 10th of an ounce! The pitch is that customers tend to be more careful than a bartender, who might be prone to spill, over pour or give away a beer on the house. Perhaps the vendor believes all customers are experts in pouring beer? Besides being able to charge by the sip, the technology is said to cut labor costs and boost revenue by encouraging customers to sample what can be a bewildering array of many expensive types of beer. Obviously each bar that has this system must provide someone to watch over the customers ensuring no product is sold to an inebriated customer. The system, therefore, blocks a customer after a certain amount of beer is poured. Then the questions is: what good is a certified cicerone if self-serving becomes a staple? Pizza restaurants have this type of system and have only four taps, which makes sense. Even some sports bars with only six taps might work. What about an establishment with 40+ taps? Some recent studies have shown that with a certified cicerone server, an account can increase its beer sales by 35%+. These certified experts are educated in helping the customer with beers for which they have indicated a preference. Such a selling technique could easily increase volume by selling a flavor the customer enjoys from the start. Upselling is much easier, just ask a sommelier. It is obvious that in this industry there is a place for both models. It just comes down to which model is right for an account and what is the account trying to accomplish? In the beer industry today, the status quo is simply unacceptable.